On April 17 I led a lettering walk for the Type Directors Club in several north Bronx neighborhoods: Norwood, Williamsbridge, Wakefield and Woodlawn Heights. In Williamsbridge we looked at the lettering on the facade of Immaculate Conception Church on Gun Hill Road (at Holland Avenue). The name is carved in a wonderful extended sans serif that fits the lintel over the doorway beautifully. Although the church was built in 1924, the letters are 19th century in style. The curves have been replaced by chamfers and the E has a short mid-bar. The spacing is based on distance rather than area between letters, but other than LATE, it looks quite nice. 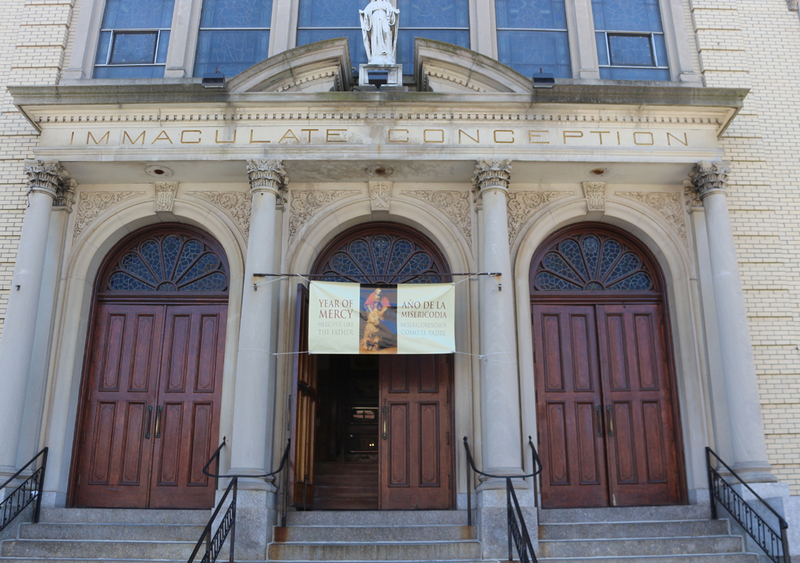 Facade of Immaculate Conception Church Capuchin Friars (1924) in the Bronx. Photograph by Paul Shaw (2016). Catholic churches often have rectories and parochial schools near them. 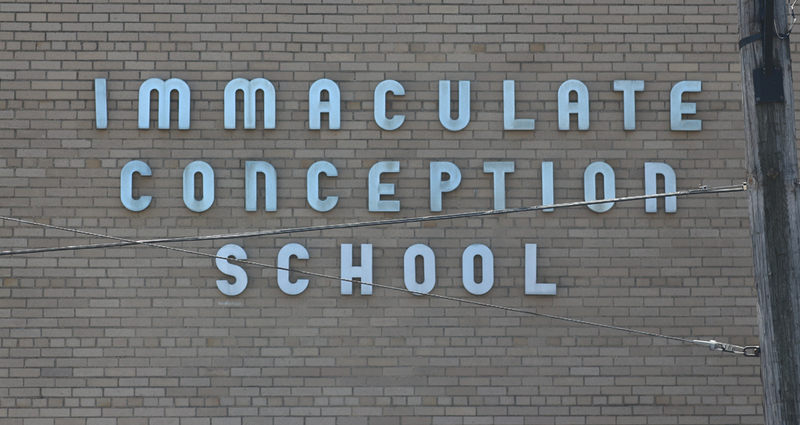 A block away was the Immaculate Conception School with metal lettering as unchurchlike as that on the church itself, but in a different manner. As we admired the letters, we tried to figure out when they were done. Dermot Hall guessed that the church was built in the 1930s. I argued for the 1950s, based on the architecture. We were both right—but in different ways. The building was built in 1950. But the letters—which are clearly moderne—predate it. It is very likely that the school was planned in the late 1930s but construction was delayed due World War II. I have seen other buildings in New York with 1930s aspects that have cornerstones with early 1950s dates. My hunch was given immediately given a boost the next day when Paul Davis, the guest speaker at my History of Graphic Design class at Parsons School of Design, showed a poster he had done for Mobil Masterpiece Theatre in 1990. I was stunned to see the Immaculate Conception School capitals (including the E) in the title. Piece of Cake. Poster design by Paul Davis for Mobil Masterpiece Theatre (1990). Courtesy of Paul Davis. 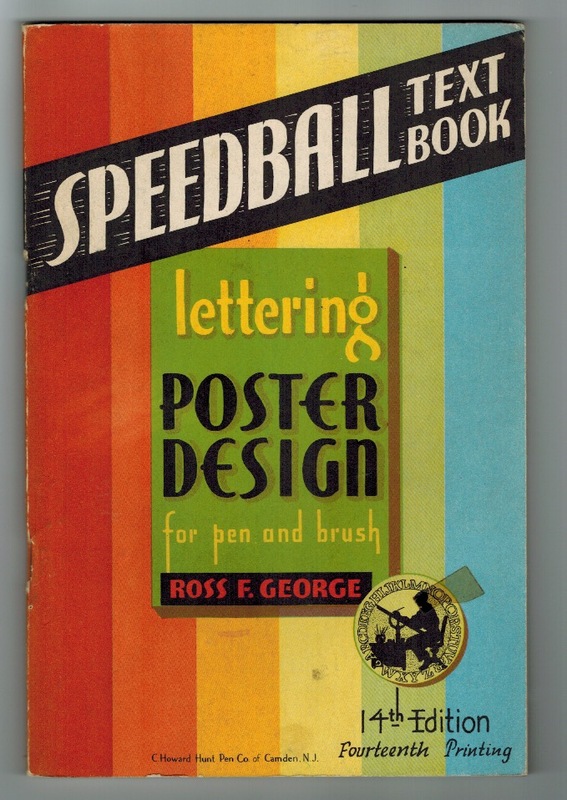 Cut-In Display Gothic (1938) from The Speedball Text Book (1941), p. 28. Courtesy of Lee Littlewood. The date of 1938 confirmed Dermot’s guess that the ICC lettering originated in the 1930s. However, close inspection of the metal letters on the school facade reveals that they are not identical to George’s alphabet. The counters are wider; the crossbars of A, H, and E are lower; and the S is curvier and closer in design to the C and G. In fact, it seems as if the fabricators of the metal letters actually improved George’s design. The big questions are who made the metal letters and when? This post has the heading Typefaces vs. Alphabets. 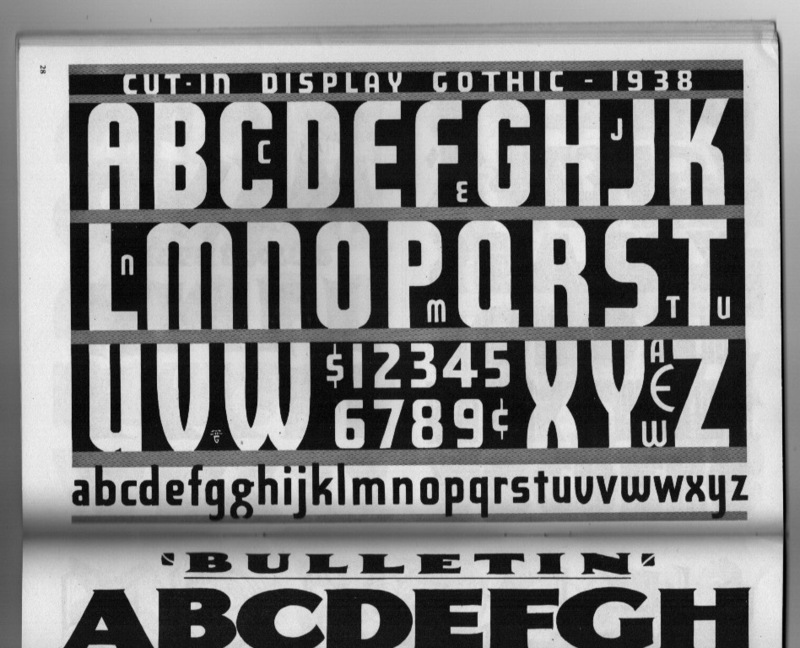 George’s Cut-In Display Gothic is an alphabet—Art Chantry’s claim to the contrary—while the letters on the school are a typeface. The difference is that the typefaces, unlike alphabets, are composed of individual letters that, having been mass produced, can be assembled, rearranged, dissembled and reassembled to form innumerably different messages. An alphabet is just a static arrangement of letters. It may be the basis for a typeface, but it is not a typeface in itself. By the way, note that George’s alphabet has alternate letters, including a reverse-3 style E.
 There are several images online of this alphabet but they all seem to be dated 1958. They are from the 17th edition of the Speedball Text Book (1957), p. 62. I don’t know why the copyright date and the alphabet date are not in sync. See “Ross F. George: Typographic Man of Mystery” in Art Chantry Speaks: A Heretic’s History of 20th Century Graphic Design (Port Townsend, Washington: Feral House, 2015), pp. 125–129. Chantry’s book a must-have for anyone interested in 20th century American (note the stress) graphic design. It is has its share of mistakes and unsupported claims, but it gets a lot right and it is a terrific companion to any of the standard histories. Note that Herbert Bayer called his unicase concept “A Universal Alphabet” rather than a typeface. He knew the difference. It only became a typeface when both The Foundry and P22 converted his letters into digital fonts in the 1990s. 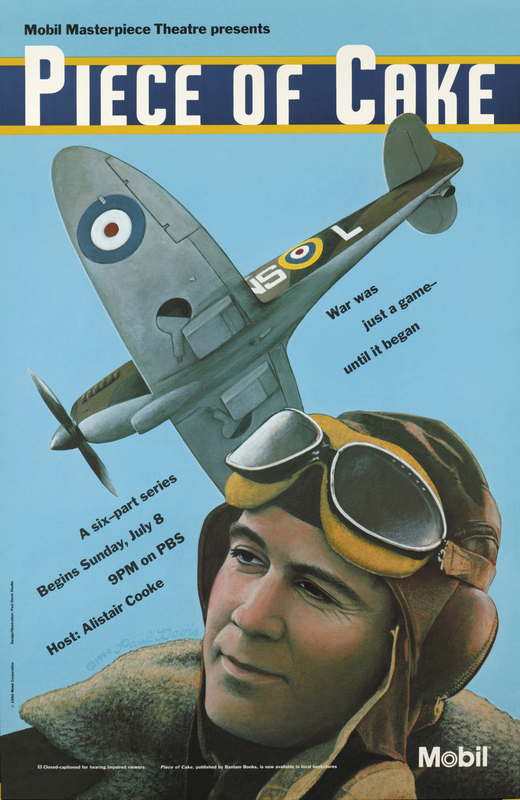 Note: Coincidentally, a month ago Rob Saunders of the Letterform Archive in San Francisco announced the acquisition of The Ross George Archive from his family.